There's plenty of smart pens out there - in fact, we got to know quite a few of them earlier in the year in the feature below - but not quite so many 'smart pads' to help complete your futuristic note taking. Well, Montblanc is aiming to readdress those number with its plush new augmented pen and pad combo... and it's a pricey one. The German maker of luxury stationary items is clearly trying up the luxury quotiant with its new offering, which combines the firms StarWalker luxury smart pen and a leather-bound (because if you're going luxury, leather is a must) pen completed with augmented paper. Augmented you say? 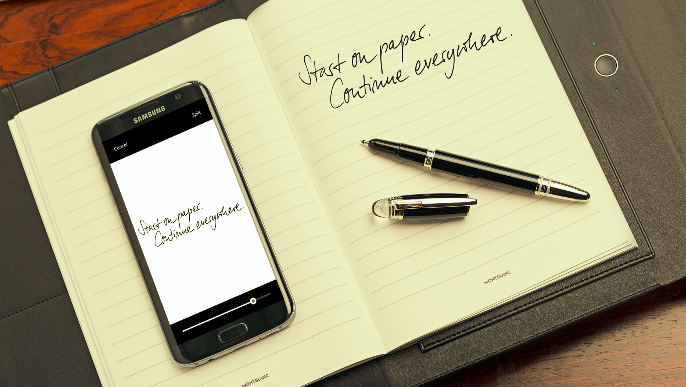 Yup, much like similar products such as LiveScribe, this plush matchup enables you to write into the pad like a normal version, only this one digitizes your caligraphy and captures every squiggle in the official Montblanc Hub app. It uses electromagnetic resonance to capture said notes and can carry on storing your thoughts, shorthand and NSFW doodles for up to eight hours on a single charge. The leather itself is 'black Italian leather' and is tanned and stitched in Florence so you're clearing getting a slice of the good life every time you have a meeting at work. And at $725 (that's about £547), this augmented pen and paper combo is quite the investment, but then again it's a bargain compared to Montblanc's fortune-destroying Montblanc Stylus that clocks in at well over $1,000.